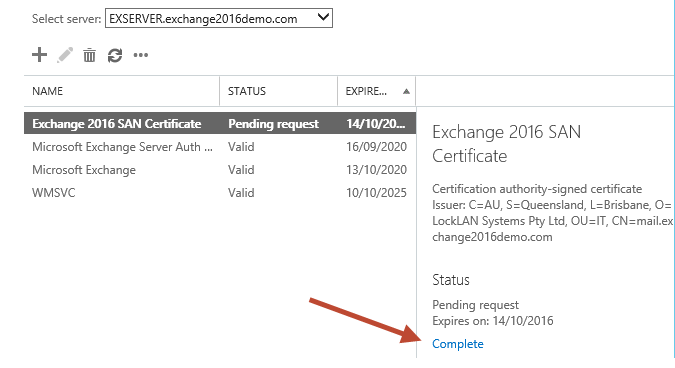 How to Install SSL Certificate on Exchange Server 2016? Certificate Authority will issue your SSL certificate via email after validating your request that you created Certificate Signing Request (CSR) for Exchange Server 2016. You will receive zip file that contains primary SSL certificate (.cer), root and intermediate certificate. You can install SSL certificate using GUI Console or Command Line Interface. 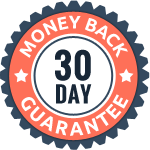 Now, you should unzip and save those files on your Exchange server 2016. 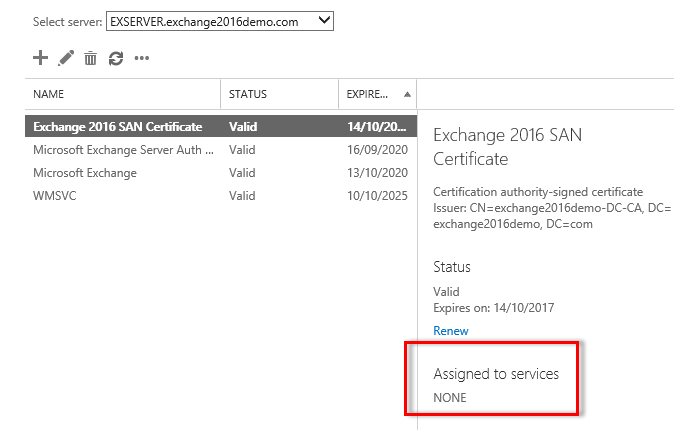 Let’s follow the steps below to install Exchange Server SSL Certificate with the Exchange Admin Center (EAC), Which is a Web-based management console for managing Exchange Server environments. 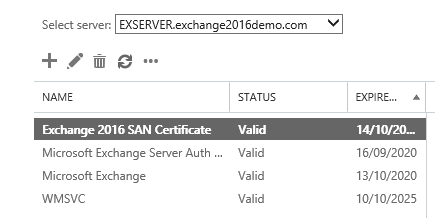 Browse and login to the Exchange Admin Center (EAC) >> Click on Servers >> Certificates >> Select Exchange server for which certificate request is pending. Click on “Complete” link on right side pane. Enter UNC path of the certificate file and click “OK”. Now, the certificate will be appeared with valid status. 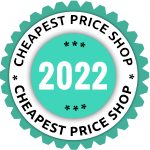 Browse again Servers >> Certificate. Select the server on which SSL certificate should be enabled. Choose SSL certificate and click on Edit Icon (Pencil Icon). Now, select services you want to assign to current certificate like SMTP, IMAP, POP, and IIS. Click Save. 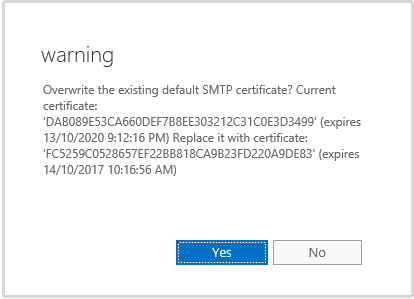 Click on warning while signing SMTP service and click “Yes” button. You can verify the SSL certificate installed on Exchange Server with SSL installation checker that will show you certificate details including common name, certain Validity period, Key pair, Issuer brand, Validation Type, Server etc..